In December 2008, the American Diabetes Association (ADA) issued its Clinical Practice Recommendations which included the option for Diabetics to follow low-carbohydrate diets as a weight-loss option. While this is obviously not ‘news’, it is important to note that the Canadian Diabetes Association – now called Diabetes Canada, does not as yet make the same recommendation. Is there something inherently different about Diabetics in Canada than Diabetics in the United States? 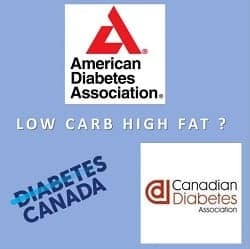 For the last 9 years the American Diabetes Association has given people the option of following what they call a “moderate” carbohydrate diet by (a) omitting some of the carb-containing foods on their standard meal plan or (b) substituting them for much lower carb alternatives. They also (c) provide Americans with the option of following a low carb diet for weight loss. Let’s take a look at the American dietary recommendations compared with the Canadian ones. Your healthcare provider may ask you to limit carbohydrate more than our meal plan suggests. This means you should cut back on the carbohydrate foods that you eat throughout the day. To keep your calorie intake about the same, substitute sources of lean protein or healthy fats for those higher carbohydrate foods. skipping the serving of brown rice at dinner and adding another non-starchy vegetable instead. For weight loss, either low-carbohydrate or low-fat calorie-restricted diets may be effective in the short-term (up to 1 year). For patients on low-carbohydrate diets, monitor lipid profiles, renal function and protein intake (in those with nephropathy), and adjust hypoglycemic therapy as needed. What the last sentence means is that doctors should monitor the cholesterol and triglyceride levels of their patients on low-carb diets and adjust the dosage of the medication prescribed to control blood sugar levels. 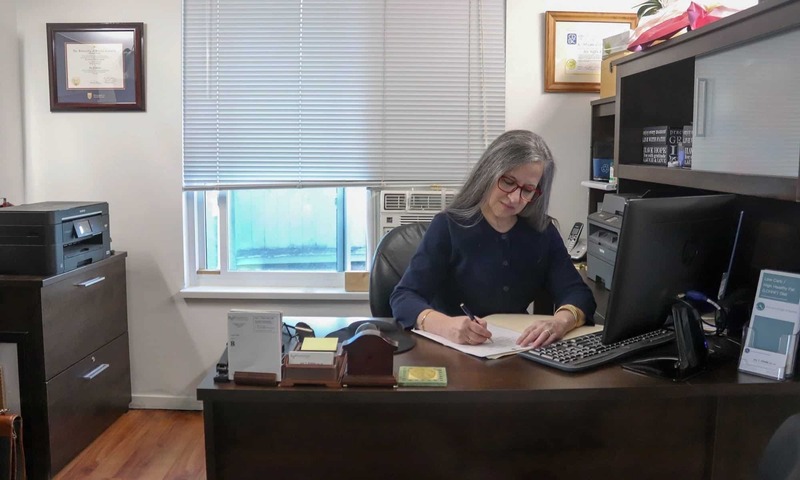 As has been the experience of physicians that prescribe a low carb high fat diet to their patients, as blood sugar levels drop – they need to reduce their patient’s medications dosages and in time, these medications are often discontinued entirely. What are the dietary recommendations given to Diabetics in Canada? 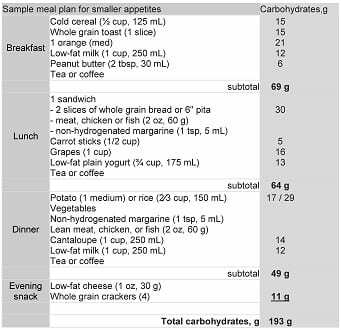 The sample meal plan for small appetites on the Diabetes Canada website recommends that people consume 193 g of carbohydrates per day which is approximately 13 servings* of carb-containing food per day (* based on the Diabetic exchanges, where 1 serving is 15 g of carbohydrate). The Diabetic Sample Meal Plan for larger appetites is the same as above, but also includes an afternoon snack with a medium apple or small banana (+ 25 g carbohydrates), plus a medium pear at supper (+29 g carbohydrates) and another glass of milk with the above evening snack (+12 g carbohydrates), amounting to 259 g of carbohydrates per day, which is almost 17 servings* of carb containing foods. Diabetics in Canada are advised to eat 45 – 60 g of carbs at each of 3 meals, plus 15 – 30 grams of carbs at each of 1-2 snacks. This is a lot of carbohydrate for someone whose body isn’t handling carbohydrates well. They encourage Canadian Diabetics to “follow these steps to count carbohydrates and help manage your blood glucose levels”. Diabetes Canada recommends that Diabetics eat ~ 1/2 of their calories as carbohydrate while at the same time advising people that “foods that contain carbohydrate … raise your blood glucose (sugar) the most”. So, when Diabetics eat the large percentage of their diet as carbs and their blood sugar is raised, what should they do? Work with your healthcare team to correct blood glucose levels that are too high or too low. I had to read this several times to make sure I wasn’t misreading it. when their blood sugars get too high, they need to have their medication adjusted to handle the load. Could this be why Diabetes is said to be “a chronic, progressive disease”? In 2007, a year before the revised recommendations came out approving either a low-carb diet or a low calorie restricted diet, the American Diabetes Association recommendations stated that ‘low carb diets were not recommended for the treatment of overweight or obesity—even in the short term, because their long-term effects were unknown and they did not seem to provide better maintenance of weight loss than low-fat diets over the long term’. Albright added that it was ‘more important that people with Diabetes choose a weight-loss plan that works for them and that their healthcare team supports their efforts and monitors their health accordingly‘. The Canadian Clinical Practice Guidelines recommends that people with Diabetes receive nutrition counselling from a Registered Dietitian. They recommend that those who are overweight or obese reduce caloric intake to achieve and maintain a healthier body weight and state that it is consistency in carbohydrate intake and in spacing and eating regular meals that may help control blood glucose levels and weight. Why are Diabetics in the US recommended to lose weight by following either a low-carb diet or a low calorie restricted diet, yet Diabetics in Canada are recommended to eat 13-17 servings of carb-containing foods per day, with 45 – 60 g of carbs at each of 3 meals, plus 15 – 30 grams of carbs at each of 1-2 snacks? That’s a good question. Many physicians report that Diabetics following LCHF diets have their medications reduced and in many cases discontinued entirely. As a Dietitian this seems preferable as a first approach, than recommending that Diabetics eat half of their calories as carbs, which would necessitate having their medication adjusted upwards when their blood sugars get too high, and having people’s Diabetes continue to worsen in time. Why should Canadians with Diabetes not be provided with choice? Copyright ©2017 BetterByDesign Nutrition Ltd.
All illustrations and text content contained on this web page are the intellectual property of The Low Carb High Fat Dietitian (a division of BetterByDesign Nutrition Ltd.). Summary of Revisions for the 2008 Clinical Practice Recommendations, Diabetes Care 2008 Jan; 31(Supplement 1): S3-S4.